DataOps comes from a background of Agile, Lean and above all DevOps - so it's no surprise that it embodies a strong focus on governance, automation and collaborative delivery. 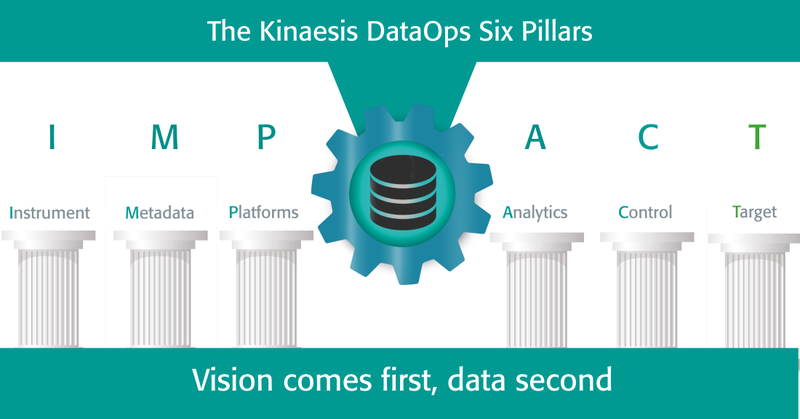 The formulation of the Kinaesis® DataOps pillars isn't too different from others, although our interpretation reflects a background in financial sector data, rather than just software. However, I believe there's an extra pillar in DataOps that’s missing from the usual set. Most versions of DataOps focus primarily on the idea of a supply chain, a data pipeline that leads to delivery via functions such as quality, analytics and lifecycle management. That's a good thing. However supply chains exist for a purpose - to support a target state, a business vision. The creation and management of that vision and the connecting of the target to actual data is just as important as the delivery of data itself. DataOps work shouldn’t be driven entirely by the current state and the available data; it should support a well-defined target. That target consists of a business vision describing the experience the business needs to have. On the software development side, it's been accepted for a long time that User Experience (UX) is an important and somewhat separate branch of software delivery. Even before the 'digital channels' trend, whole companies focused on designing and building a user friendly experience. Delivering an experience is different from working to a spec because a close interaction with actual users is required. Whole new approaches to testing and ways of measuring success are needed. UX development includes important methodologies such as iterative refinement - a flavour of Agile which involves delivering a whole solution at a certain level of detail and then drilling down to refine certain aspects of the experience, as necessary. Eventually, UX has become a mature recognised branch of software development. Delivery of data has much to learn from UX approaches. If users are expected to make decisions based on the data - via dashboards, analytics, ML or free-form discovery - then essentially you are providing a user experience, a visual workflow in which users will interact with the data to explore and to achieve a result. That's far closer to UX development than to a traditional functional requirements document. To achieve results that are truly transformative for the business, those UX principles can be applied to data delivery. 'User journeys' can provide a way to record and express the actual workflow of users across time as they exploit data. Rapid prototyping can be used to evaluate and refine dashboard ideas. Requirements can, and should, be driven from the user's desktop experience, not allowed to flow down from IT. All these artefacts are developed in a way that not only contributes to the target, but allows pragmatic assessment of the required effort. Most of all, work should start with a vision expressing how the business should ideally be using information. That vision can be elicited through a design exercise, whose aim is not to specify data flows and metadata (that comes later) but to show how the information in question should be used, how it should be adding value if legacy features and old habits were not in the way. Some would even say this vision does not have to be, strictly speaking, feasible; I'm not sure I'd go that far, but certainly the aim is to show the art of the possible, an aspirational target state against which subsequent changes to data delivery can be measured. Without that vision, DataOps only really optimises what’s already there - it can improve quality but it can't turn data into better information and deeper knowledge. Sometimes, the remit of DataOps is just to improve quality, to reduce defects or to satisfy auditors and this in itself is often an interesting and substantial challenge. But when the aim is to transform and empower business, to improve decisions, to discover opportunity, we need our Target pillar: a design process, along with an early investment in developing a vision. That way, our data delivery can truly become an agent of transformation.